A strategic dice-placement game set in a fantasy world. 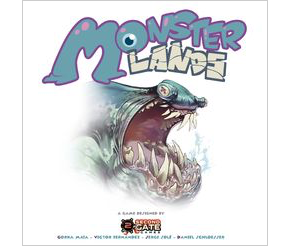 Second Gate Games, makers of the tower defence game B.Sieged: Sons of the Abyss, changed direction a bit with their second game, Monster Lands. Not only did they abandon the whole letter-in-the-title thing (though it was actually going to be called M Lands until I and some others whinged about it), but they went for a more strategic, less random kind of game free of miniatures that blends thematic fun with dice management. And the result is a great success. Monster Lands presents you with a constant stream of interesting choices, but it all boils down to optimising your purchases of mercenaries and their equipment, then heading out into the lands to capture and kill monsters. You do this by placing dice subject to a host of restrictions and choices, then rolling those dice to see if you’re successful. So you’re constantly mitigating the luck factor and choosing whether or not to push the odds. It makes for an exciting, tense, and very fun experience. After I whinged about the original name, Second Gate kindly decided to include one of my rules summaries in the game as a Kickstarter goal. It came out very nicely, but some formatting errors creeped in when they made some changes, so here’s a corrected version to download and print. There’s a lot of special powers and icons in the game, so this should make play a lot easier and smoother.